If beauty is simplicity, then Trevor T. Smith should be strolling the catwalks of London fashion week. 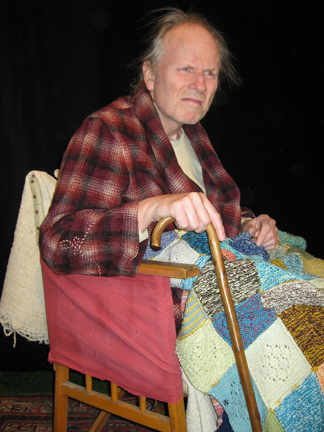 An Evening with Dementia is pure-breed, engagement theatre without the theatrics: an old man, in a chair, speaking. But if you’re thinking Krapp’s Last Tape, don’t; this is a sumptuously ideas-based script with hardly a stage direction in sight, and it is proof that writing and consequently, performing your own work can be the most seamless way of transferring penned character to the stage. With a hand that never stops shaking, a mouthful of missing teeth and a listless shifting stare, the old man meets us as we creep in through the theatre doors. There’s a fear from the audience that they’re in for a gruelling hour of depressing interrogation into why they don’t spend more time with the elderly, but this play’s much too clever for that. As the protagonist often states, he used to be an actor, and he clearly knows a thing or two about how to hold an audience. Cascading between light-hearted tips on how avoid answering pesky everyday questions, and the lows of a loneliness devoid of even your own self to converse with, the play guides you through the stream of consciousness of a man very much alive, but very much not all there. And despite covering the classic geriatric topics of ‘the state of society today’, ‘the war’ and ‘people making too much noise’, the script never falls into cliché, always ensuring a sense of personality which feels genuine and natural. If the characters in ‘ideas’ plays can be too vacuous, and the ideas in ‘character’ plays too tired, An Evening with Dementia strikes a razor-sharp balance between the two. The articulation of the idea that love is common sense and that people walk around with walls of fear around them is subtle enough to avoid the impersonality of sociology, despite its abstract overtones. Whereas, the stories of his mother singing during the war, have enough resonance with the psychological issues at hand that they become much more than a tool to evoke sympathy for the character. Of course, this masterful script could crumble if it wasn’t performed with the right mix of vigour and despair, and by virtue of being the playwright, it was Smith’s own even before his first rehearsed reading. Nevertheless, the actor has absorbed the words so deeply that any fissure that does appear between what is said and what is meant to be said is so aligned with the mental-illness that he suffers from (or ‘takes pleasure in’ as the old man will have you know) that there’s never a hiccup in the performance. Another deft touch is Smith’s ascent into the audience. At about forty minutes in, the actor’s self-imposed interval both reinvigorates and challenges those watching him. Maybe he doesn’t want to be watched anymore? And why, oh why, are they paying to see a show where nothing happens? The trick is that Smith is now sat in the front row and all eyes are still on him, he’s stretched beyond the upstage, past the fourth-wall and into the hearts of a giving audience who have no choice but to accept him. So, by the time he’s crept, achingly, back to his cushioned seat and onto his next anecdote about King Lear, we share his amnesia in wondering whether he ever really did leave his chair in the first place. With a set nothing more than a chair, a rug, and a black back drop, no recorded sound and a single glowing light above him, Smith has succeeded in squeezing his piece into the twilight of pre-show drinks before the feature length show at the New End. But what a clever use of a theatre space, and what savvy stage management to incorporate a Fringe hit and give a home to the most truthful, emotional and well-presented one-man monologues you’ll see all year.